This small terrestrial orchid is quite a unique species and is listed as ‘vulnerable’ at the state level. It is monotypic, ie, the only species in its genus, only 210 plants are known to exist across a scattered distribution from Port Stephens to Ulladulla on the NSW coast. It grows from a perennial tuber-like root emerging in late January to March as a single flowering stem with flowers lasting 2-3 weeks. Flowering does not occur unless a significant rainfall event (20-25 mm) in a 24-hour period occurs during January or February. This makes the species very vulnerable to drought and inconsistent late summer to early autumn rainfall (a feature of the very long drought during the first seven years of this century). In the Bushland, the orchid is found in Scribbly Gum/Red Bloodwood woodland on the sandstone plateau mainly within the arc of vacant Crown land formed by Falcon Crescent, North Nowra. The one known site outside this arc is within the Bomaderry Creek Regional Park and on the route of Council’s proposed link road. This may explain why the site was vandalised in early 2012 involving hand tool scraping of the soil surface exactly where the plants were previously recorded. 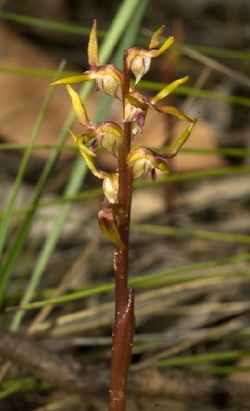 The unique characteristics of this species, its limited numbers and natural and human threats to its survival led Alan Stephenson, Shoalhaven’s acknowledged native orchid expert, to seek its listing at the national level and as a ‘critically endangered’ species at both national and state levels. A decision on this application is anticipated shortly.